This Page contains a guide on the Fishing Mini-Game, including How to Participate, What to obtain, and What bait to use. We will be updating this as we go along. This Page contains a guide on the Fishing Mini-Game, including How to Participate, What to obtain, and What bait to use. 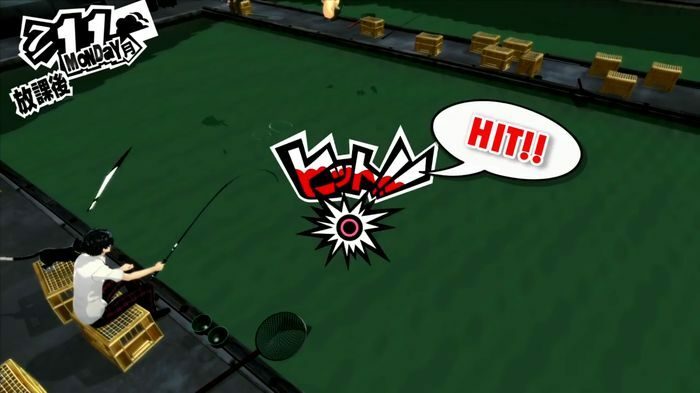 This article contains information on the fishing mini-game in Persona 5. It provides a summary on how to participate, how to catch a fish, which bait to use, and the corresponding fish that can be captured. In comparison to Persona 4 Golden, there is no need to acquire a fishing rod to start fishing in Persona 5. To start the mini-game, simply head to the Ichigaya fishing pond near Shinjuku and pay ¥3000. By paying the fee, you will obtain 7 “Small Bait.” When you reel in multiple fish, there is a chance to obtain prizes. The best time to fish is during the evening as the Spot offers a discount. The first step to becoming a good angler is to use the appropriate bait. The next step is to determine which direction to throw the bait. Before throwing the bait, a Power Gauge will be displayed. The distance covered depends on the force applied. After some time, it is possible to get a “Hit.” Reel in with the ○ button. Keep everything aligned with the L1 button. To successfully catch the fish, you have to drag it all the way to yourself.